The Palestinian Authority presents terrorists as heroes and role models for children by naming summer camps after them. In addition, summer camps are named for Israeli cities, which are presented as Palestinian cities, as part of the PA’s ongoing message to children not to recognize Israel. This section includes some examples among many. Headline: "A mass-participant ceremony on Thursday for the conclusion of the summer camps in Ramallah"
"With the approach of the conclusion of the summer camps and the preparations for the central closing ceremony that the [PLO] Supreme Council for Sport and Youth Affairs will hold in Ramallah, the activities are continuing vigorously and with an unprecedented response from civil society... The activities, meetings, conferences, and lectures are continuing in the Jericho district in 11 camps, including... the summer camp organized by the Ein Al-Sultan Center, whose groups are named after Martyr (Shahid) leaders Yasser Arafat, Ghassan Kanafani (i.e., a PFLP terror leader), Dalal Mughrabi (i.e., terrorist who led murder of 37, 12 of them children), Khalil Al-Wazir (i.e., terrorist responsible for attacks in which 125 Israelis were murdered), and Laila Khaled (i.e., PFLP terrorist and plane hijacker)." 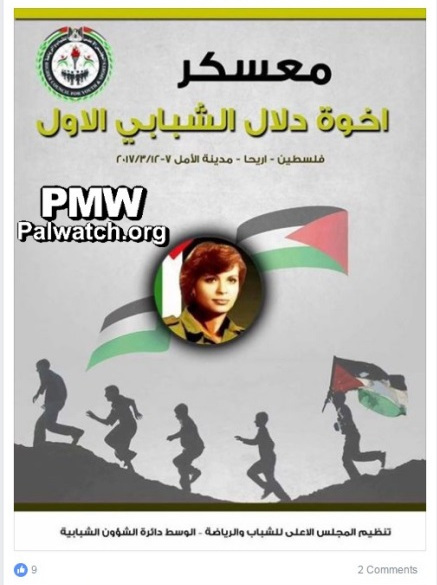 “The [PA] Ministry of Culture office in the Salfit district visited the summer camps in Yasuf, with some of the most prominent of them being the Martyr (Shahida) Dalal Mughrabi Camp (i.e., terrorist who led murder of 37, 12 of them children) [held] under the supervision of the Fatah Movement and the Yasuf Youth Club, and the Childhood Ambassadors Camp that is funded by the World Vision organization and the Yasuf Village Council. 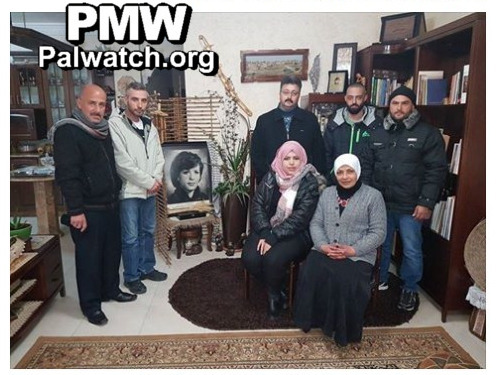 The image shows a picture of Dalal Mughrabi - a terrorist who led the murder of 37 Israeli civilians, 12 of them children - in the center, with a Palestinian flag behind it. Below her picture, children are seen running, while one carries a Palestinian flag. Director-General of the Center Council Mu'tasim Abu Gharbieh noted that... the staff met with a number of relevant national institutions and figures, the most prominent of them being the district governor of Jericho and the Jordan Valley, representatives of the security institutions and national institutions, the Madinat Al-Amal administration, District Governor of Ramallah and El-Bireh Laila Ghannam, and Rashida Mughrabi, the sister of Martyr Dalal Mughrabi. Abu Gharbieh also praised the support that the Center Council received from Head of the Supreme Council for Sport and Youth Affairs Jibril Rajoub..."
A delegation from the Center [West Bank] Council for Youth and Sports met with Rashida Mughrabi… The meeting revolved around the preparations that the Center Council is making to hold the first Brothers of Dalal camp for youth in Jericho next month.